Thank you so much for this. I typically soak overnight but forgot for a Sunday night chicken dish I am making. So I appreciate your detailed instructions on how to quick soak the beans. And I agree, you can never eat canned beans again once you start soaking and cooking your own. 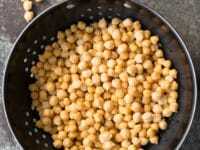 Chickpeas are beans, or legumes. They are sometimes called garbanzo beans. 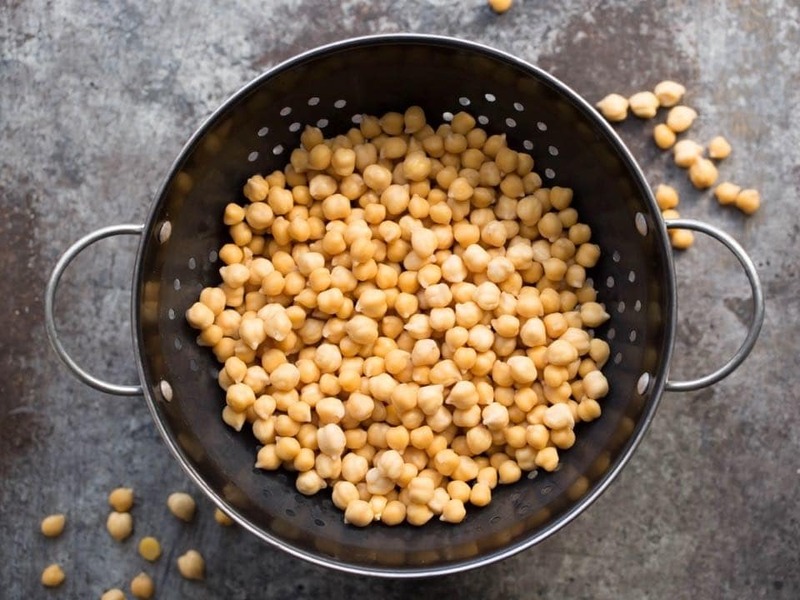 What about using chickpeas in a Crock pot? Most recipes I’ve seen seem to say to use canned which dont need presoaking. In a crock pot they will be soaking and cooking in water for 3.5-4 hours. Do they still need to be soaked 1st? Yes, I recommend soaking first. 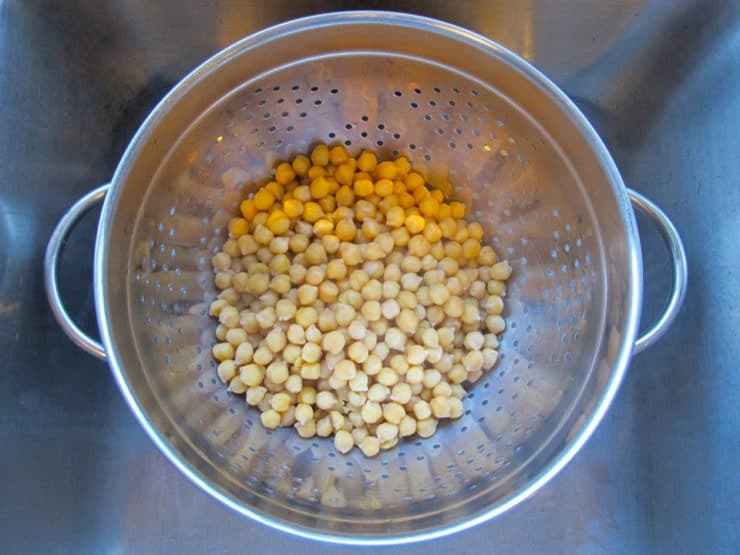 3 1/2 – 4 hours in a slow cooker is not enough time to soften chickpeas without a soak. Overnight, maybe… but even then I recommend at least a quick soak to be on the safe side. Thank you Tori: You have made a dramatic improvement to my already great Chicken/Beef Vegetable Broth Soup. Unlike most recipes that calls for the vegetables to cook with the chicken and beef parts, I add them in as freshly cooked vegetables just before making a soup along with all the spices. I simmer the broth in bulk for two days, which I then freeze in soup size s/s. containers. Then when I make the soup, I add in the vegetables and spices. I always would have loved to add chickpeas but I don’t like canned food. I followed your advise and it turned out great. I now have the best tasting chicken-beef-vegetable broth soup in the world. No need for joint supplements (or knee replacements after a number of sports injuries) this soup does the job and the taste is fantastic. How do I get the skins off the chickpeas? My wife only wants to use canned chick peas because she doesn’t like the skins. I share an easy method for removing the skins in my hummus recipe. I accidentally covered my beans with a tight lid instead of a towel while soaking overnight- is that OK? BTW thank you so much for this! 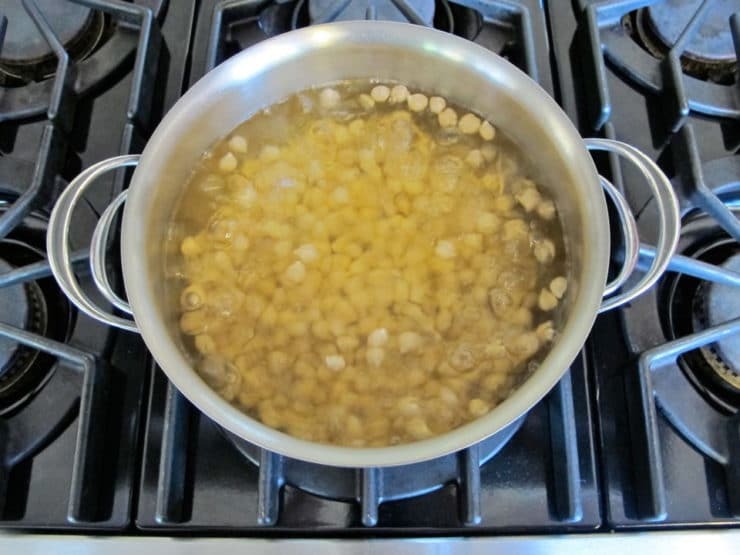 I cooked my own garbanzo beans for the first time a few weeks ago after reading this post. They came out great! Great tutorial! 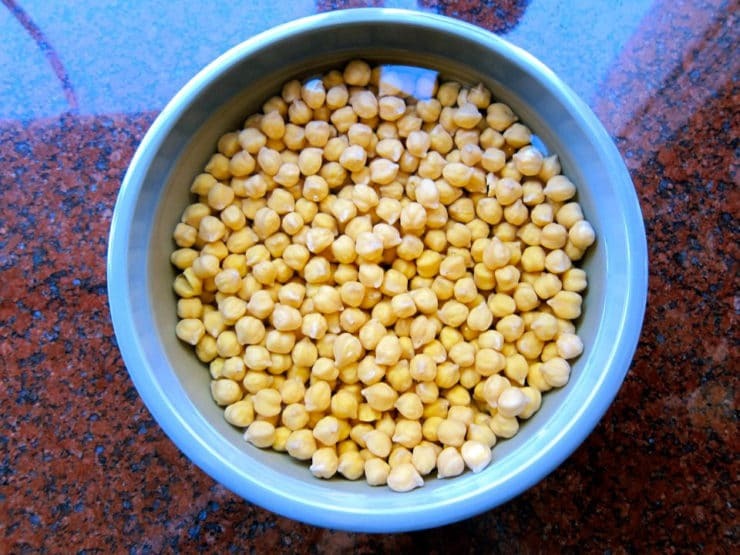 In India – we soak chickpeas overnight and pressure cook them in the morning. It’s a lot easier than boiling them, watching the clock, rinsing them in cold water and boiling them again. Just add the soaked beans and water in a 1:2 ratio to a pressure cooker and wait for 5 – 6 whistles. Older beans take longer and need more whistles (8), and if you’re making hummus – you will need about 10 whistles. You can save the cooking water and use it in the place of broth for soups or stew. I use the cooking water to make a simple yet nutrient-rich curry with garlic, onions, tomatoes and chickpeas. Amazing results! Yes a pressure cooker will certainly speed things up. Now that they are becoming more popular, I should probably cover the process on the blog. Thanks for sharing! thanks for this – I just saw the movie “In Search of Israeli Food” and they talked about home-made hummus. I am using your method of overnight and cooking. Question: I need to cook them softer for the hummus. Of course I soaked too many. Can I freeze the softer bean – will that still be ok.
Hi Carolyn – yes no problem with freezing the cooked beans. Do I have to boil them if I just want to put them in some brownies? I’m not sure why you would add chickpeas to brownies, but if you want to do so, I would suggest boiling them first. Most baked goods that involve chickpeas use chickpea flour, not whole soaked or cooked chickpeas. I like this series and how it highlights not only the idiosyncrasies of different beans but also how the ultimate use of the bean (e.g., removing chickpea skins before making hummus) might change change how you prepare it for the recipe. Thank you! In the soaking to spouted method it says to keep the water cold and to change it twice daily. Can you simply put the pot in the fridge until sprouting begins? Hi Mark– for food safety reasons it is recommended to change the water twice daily, even when refrigerating. So you can refrigerate, but be sure to change water regularly. thanks for the tutorial. You can also save the cooking water and use it like egg whites in frosting, meringue, and other recipes ( the chickpea cooking water is called aquafaba). I’ve used it for royal frosting; amazing results. This was very helpful, God bless you! I’d try cooking my other beans this way. I will try the soak overnight / freeze storage. Thanks for all the great suggestions for making these dry Garbanzos. That’s weird – food is food and people aren’t. Let’s ask Hannibal…. Thanks for the tips. 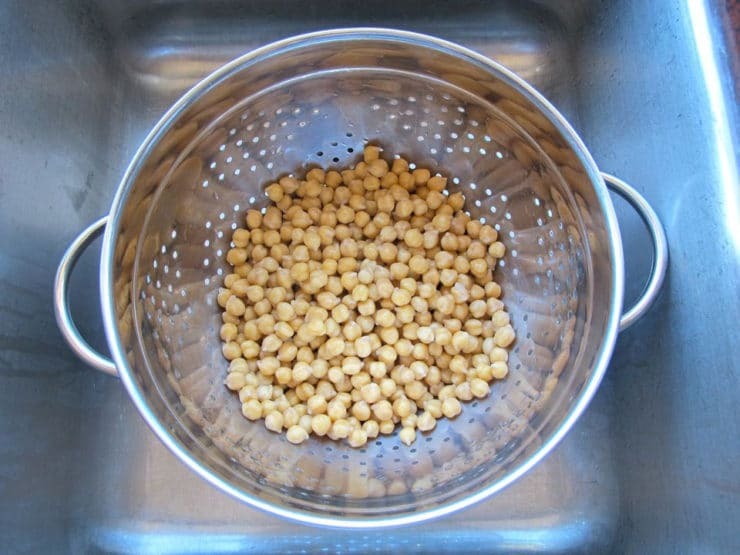 I love chickpeas as well and wanted to stop using the canned chickpeas. Hello, I was wondering if I soaked my chick peas for 3 hrs and then drained them and kept them in the fridge for two days and then started boiling them. Have they gone bad? Hi Rena, Tori’s assistant Ashley here. Normally we do not put the chickpeas in the refrigerator after soaking, so I’m not sure if it would change the outcome of the recipe. I wouldn’t think so. As long as they smell and appear normal, I don’t think they have gone bad. Hi. I’ve just soaked my chickpeas and there’s a really eggy smell coming from them. Not very pleasant. It seems to be getting stronger as I cook them. Are they ok? Hi Amy, Tori’s assistant Ashley here. Chickpeas do have their own unique smell, though I wouldn’t say it’s bad. If they don’t smell right to you I would recommend starting over. Do you take the skin off the chick peas once their cooked? Hi Lynn, Tori’s assistant Ashley here. You can certainly remove the skins if you’d like. We prefer to remove the skins when making hummus, for creamier results. Thank you! Beans are great values in any case, but when I contemplated throwing away 2/3 of my cooking effort I was sickened to waste all these nutrients! According to the label on the bag garbonzos provide 28 % of both carbohydrates and protein from a serving of just 1 1/4 cup! Truly a power food! I can now turn my attention to using them for soups, salads and stews I have discovered. Just soaked my first chickpeas for about 12hours and I cooked it for another 1hour. Though I have not decided what to do with it but I like the taste already….will check online for interesting recipes. I am confused! At the beginning you say this takes total soak and cook time 2hrs 30mins: the recipe says 1 hr soak, then boil for 5 mins then leave in the hot water for 1hr, then cook for 60 – 90 mins. Hi Helen! The length of time varies based on the preparation method used… an overnight soak will take overnight. Just follow the instructions rather than the total time suggestion and you should be fine. 🙂 I will remove the time suggestion to avoid confusion, since it varies. 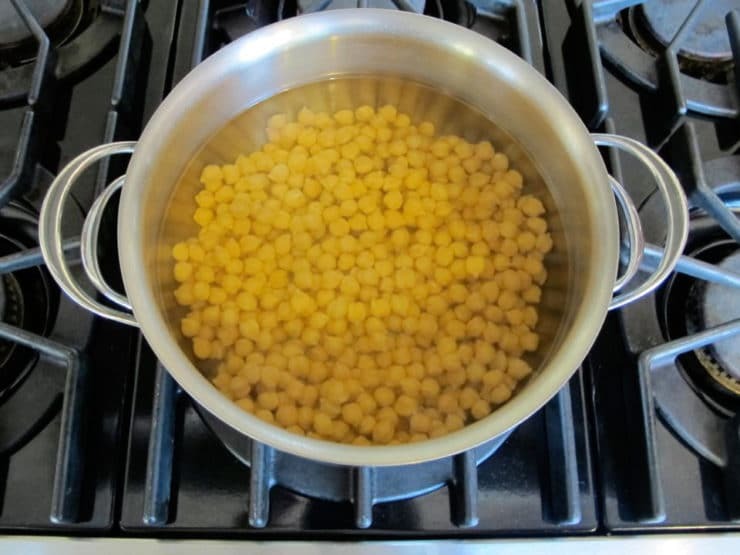 If you have a pressure cooker (I have an electric one so i dont have to watch it constantly) just rinse and sort them then pour them (I make 4 cups at a time so as not to overload my pressure cooker) into your cooker and add water to within 2-3 inches over the tops of your chick peas. No soaking needed! Obviously this will end up with alot more since they swell up. I never go over half the capacity of my cooker because beans and peas are foamy. Add-2-3 Tablespoons olive oil or another oil. This cuts down on foaming. So basicly if you have a 5 Liter cooker and peas and bring water up to 2 1/2 Liters. Cook at high pressure for 35 minutes and allow to natural release. This makes perfect chickpeas. Pour your water off and rinse if desired. They are ready to go! I bought some dry garbanzo beans thinking they were roasted. How long do I need to soak and then boil, before roasting them? Follow the instructions above for soaking and cooking the beans, then proceed with roasting. Hi Ruth, how long did you cook them? They might have needed to cook longer. Also older chickpeas (that have been in the bulk bin too long) can sometimes be difficult to soften, which might have resulted in the uneven results. A quarter teaspoon of baking soda in the cooking water ensures an evenly nice soft bean every time for me! I cooked my first batch of dried chickpeas tonight and noticed a few transparent “skins” coming off of them and floating to the top. Do these need to be discarded from the chickpeas? Hi Laurel, Tori’s assistant Ashley here. Yes, you can discard any of the skins that float to the top of the water. 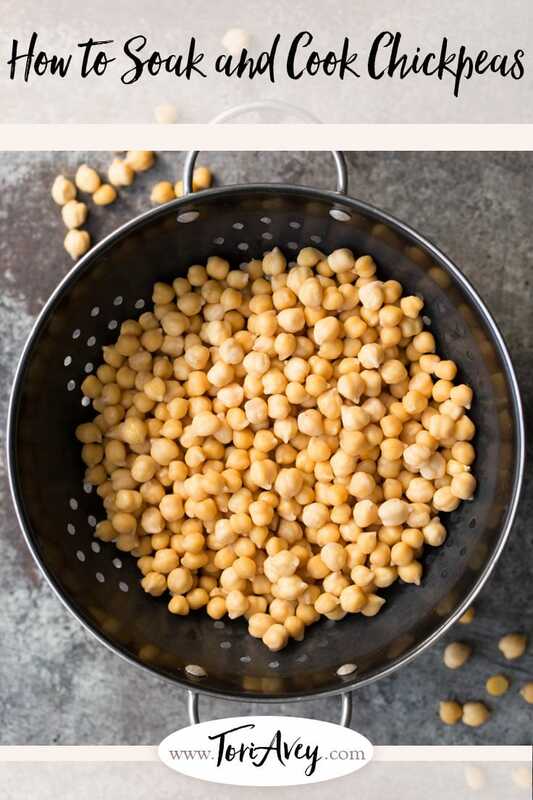 Thanks for the article, I felt so lazy about going through all the chickpea process for just a single dish. With the freezing instructions now I can plan ahead for a bunch of dishes. I was told in the market that I could cook them for 10 minutes in a pressure cooker. Is it true? I cooked mine in a pressure cooker after soaking overnight. Was making hommus so had it at pressure for 15 minutes to make sure they were tender but instructions suggested 10-12minutes. You use a ‘natural’ pressure release method so it’ll take a little longer to get the pressure down but at least you don’t have to sit at the stove the whole time. When soaking the beans overnight do you place them in the fridge or leave them on the counter? Hi Christine, Tori’s assistant Ashley here. We leave the beans on the counter at room temp while they soak. Ashley, in south east asia room temp can be 29-33 degrees Celsius. So what room temperature do you mean ? 16-20 or 20-25? Thank you! Just soaked a bag of the Chick Peas for the first time, now I know what to do next! Hi – I was planning on making falafel before Passover but turns out, I won’t have the time. I’ve already soaked and drained my chickpeas and was wondering if it’s ok to freeze them in this state and then thaw them after Passover to use in your falafel recipe? Hi Jeff– I’ve never frozen soaked chickpeas before. Theoretically I think it should work, but I can’t promise because I’ve only frozen cooked beans in the past. If you try it, please report back and let us know if you had any issues. Or if you’re worried, just cook the beans and freeze them for use in other recipes, then start with a fresh batch for falafel after Passover. 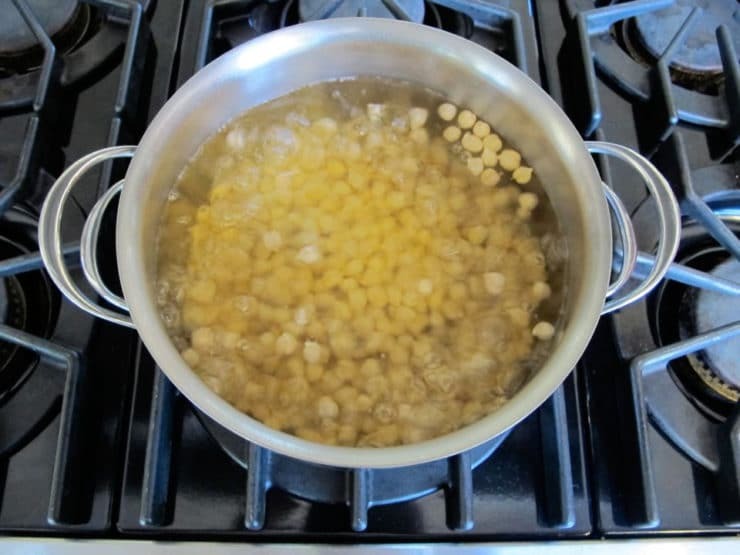 Here is a tutorial if you need guidance: https://toriavey.com/how-to/2012/10/how-to-soak-and-cook-chickpeas/ Good luck! I soak-then-freeze beans for future final cooking all the time! Prep work is done & beans ready to boil (for bean soups, hummus, etc) right from the freezer. Thank you for chiming in Lori, glad to know the soaking-freezing method works! 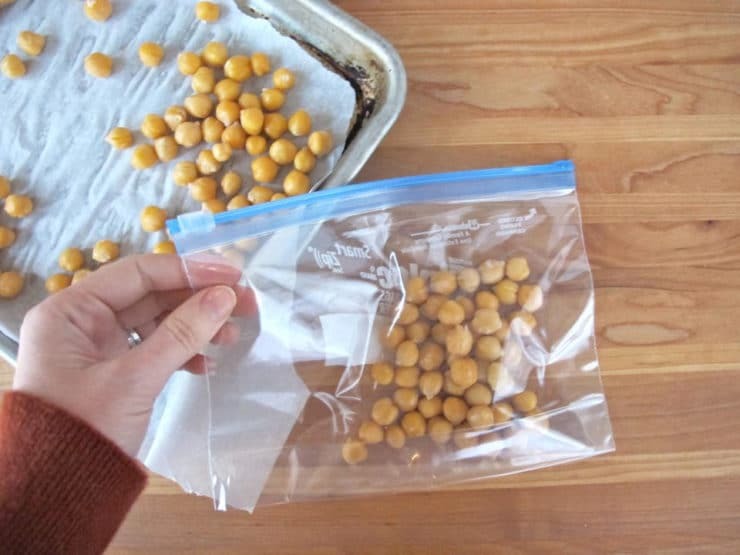 I have been trying to cut down on extra waste and just bought dried chickpeas recently, since I’ve been going through a couple cans each week… I love the idea of prepping and freezing them! I’m going to start soaking them to sprout tomorrow (sprouted beans, nuts and seeds are so great for you!). Thank you! Thank you for this info. Soaking my GB for the first time in water for 24 hours. Was going to soak them in a bag but thought it my leak, bowl is best option. I will cook them this afternoon and hummus tonight. I rinse them a bit from the foul water and boil them for 60-90 minutes to then be able to put them in the blender. Took me awhile to figure this out & re-read your article 3 times in order to figure this out. Because you specify how to cook them after the fast & easy method of 1hour soak, but you do not specify what to do after they have been sitting all night & how much boil time they require for a hummus dish. 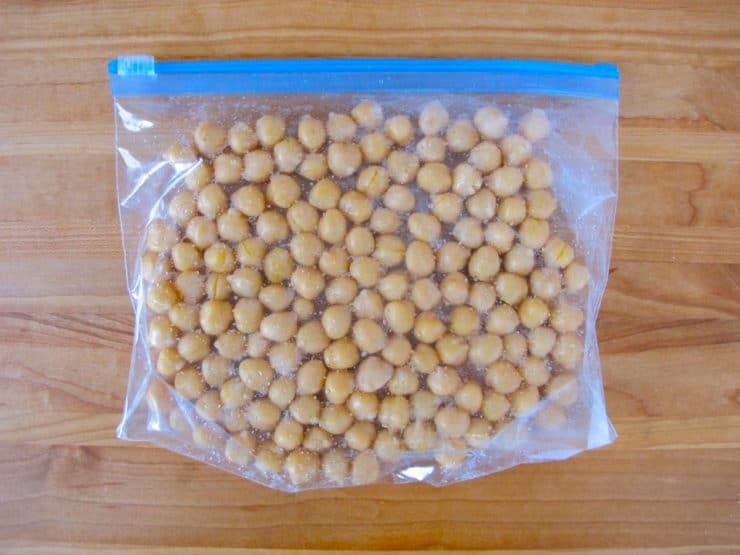 Can you cook chickpeas from frozen or do you need to defrost first? You can cook them from frozen. Thank you *so* much for these clear, concise tips! I appreciate these instructions immensely, especially as I’ve begun the long transition to a zero waste lifestyle and have started shopping in bulk and–naturally–have had so many questions along the way. You rock! This is very detailed and a great resource for me. I am a newbie to batch cooking beans. Would you mind detailing what is meant by “cook” the beans: Let the beans cook for 60-90 minutes…? Bring to a boil, reduce to a simmer (a light boil) and let the summer for 60-90 minutes. Thank you for your very helpful article on Chickpeas. Please could you advise how long the Chickpeas would last, if I oven roasted them? Hi Tory! I read online somewhere that if I soak my dried chickpeas overnight I can cook them in ten minutes before turning into hummus. I can’t find the recipe anymore – can you confirm if this is true? If not I believe I can turn them into falafel instead without cooking them? Thank you! Thanks for the easy to follow instructions! I am just learning how to cook healthy! Really I am learning how to cook?! I will definitely be using your websites often! Im about to give the quick soak a try. Thank you for sharing! Thanks so much for these clear and complete instructions. I will now buy the 2kg box of chickpeas and I know I can freeze leftovers! Soak overnight in the fridge or can be left out? Making your chicken shawarma recipe and already made homemade tahini sauce. Ellen, they can be left out. Enjoy! Is there anything special procedure to follow, when defrosting the chickpeas? And, finally, any suggestions to avoid freezer burn on the peas? The cooking water has gaseous qualities, which is why it is more common practice to discard. That doesn’t mean to say you have to, only that it’s easier on the digestion not to use it. You can defrost the chickpeas in the refrigerator, in hot water on the stovetop, or simply add them to your recipe– they will defrost and warm up in no time. If you follow the instructions here you should have no trouble with freezer burn, however I wouldn’t keep the beans frozen for longer than 6 months for optimal flavor. Hi Michele, Tori’s assistant Ashley here. 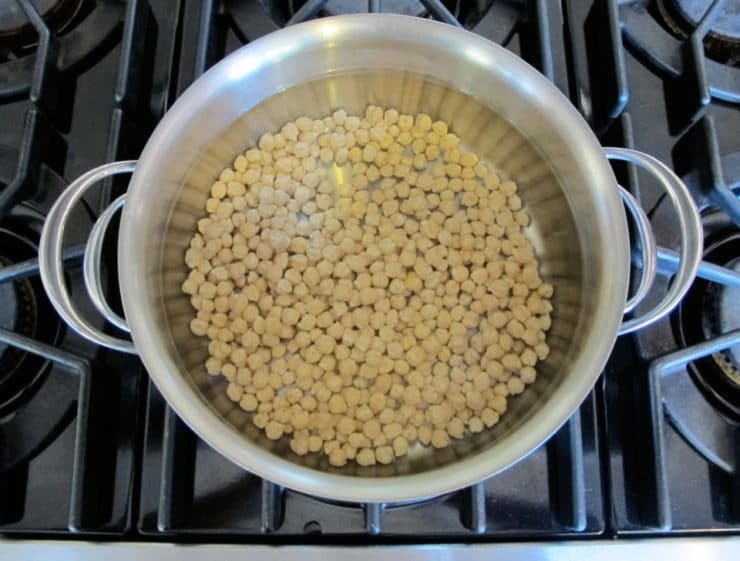 We like to remove the moisture from the chickpeas so that they freeze well without clumping together. Thank you so much for this! My goal in 2017 is to never buy another can of beans, of any kind. The sludge and salt just do not appeal to me. This guide proves its not as challenging as one might think. I used no salt but, I did add large pieces of onions, carrots and celery when I cooked them. (Easy to pick out) As a result, I did not need any additional salt in the first dish I used these in. Perfect the way they were & my fiance ate so many before I got them bagged up for the freezer! Thanks Tori for the tutorial and commenters for your tips! What do you do with the white foam that comes up at the top of the pot when boiling the peas? Hi Leila, Tori’s assistant Ashley here! If you’d like you can skim the foam off and discard it. I had some dried chickpeas and decided to use them for a chana masala (an indian vegetarian dish I was making). I soaked the chickpeas overnight, and then followed your instructions to cook them until soft. They were superb, tasty and sooo creamy — I kept nibbling on them and was reminded how much better these were compared to what comes from a can. I will cook more and freeze them to have on hand. Thanks Tori! Glad all are enjoying Arab food. Sehtain! Soaked dried beans for 24 hours, rinsed and added fresh water, 1 tsp salt and a few sprigs of fresh thyme, get it boiling then turn heat down to simmer for about an hour and a half (remember to stir it up occasionally) or until beans are tender. A little salt and small amount of fresh bundled herbs during the boiling process can add a nice flavor to your humus. Please do another one on roasting chickpeas. Crunchy ! things, The website taste is great, the articles is really nice : D.
If you add baking soda to the beans when soaking overnight the cooking time will be much reduced. This tip was in a Lebanese Recipe I have for hummus. 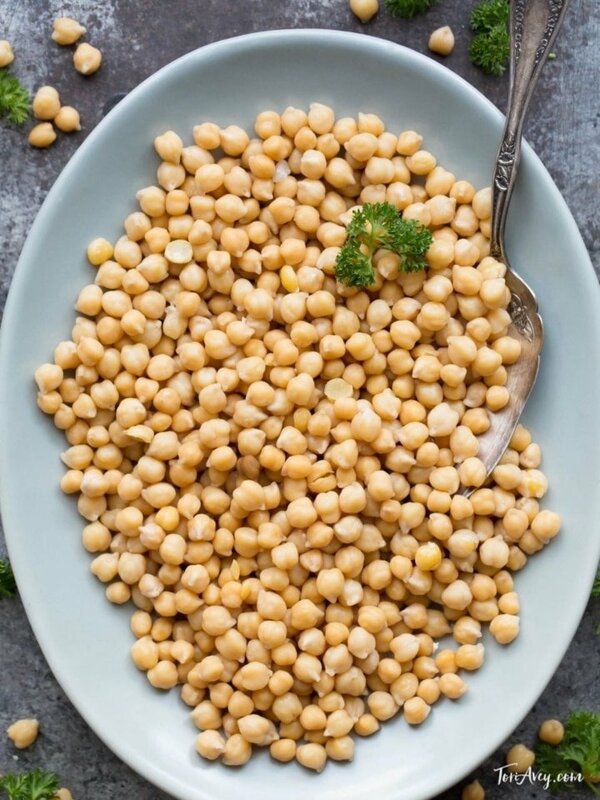 I have never liked canned chickpeas, so rarely ate them.I have been trying to make some healthy changes in my diet so decided to cook them from scratch using your method. I couldn’t believe the difference in taste. They are so yummy! In fact, since I finished cooking them this morning I went ahead and had a bowl with almond milk and honey for breakfast instead of my routine oatmeal. Delicious! I was glad to read they can be easily frozen so I will definitely be making in larger batches so I can make them a regular staple to my diet. Thanks to the blogger or (Tori right?) person who wrote this post. I am just not as familiar as I am with easier legumes/beans like lentils. I am for one afraid it will take 3 or more hours to get them soft enough to be desirable. Secondly I hate the issue of foaming over and spilling liquid on the stove when cooking chickpeas. This should be an excellent addition to lamb shank stew that I’m planning on making! Other ingredients: tomatoes, garlic, basil, oregano, black pepper, and Omani lemon. that’s really helpful information, thank you! will definitely help me learn to make DIY hummus! I’d personally avoid using plastic bags/products for storing/freezing food as plastic products leak potentially dangerous toxins. Is there a way to preserve food/chickpeas in this case in glass cans? I might be opening a huge topic with this, worth a whole blog post. Either way, thanks and I look forward to your reply! 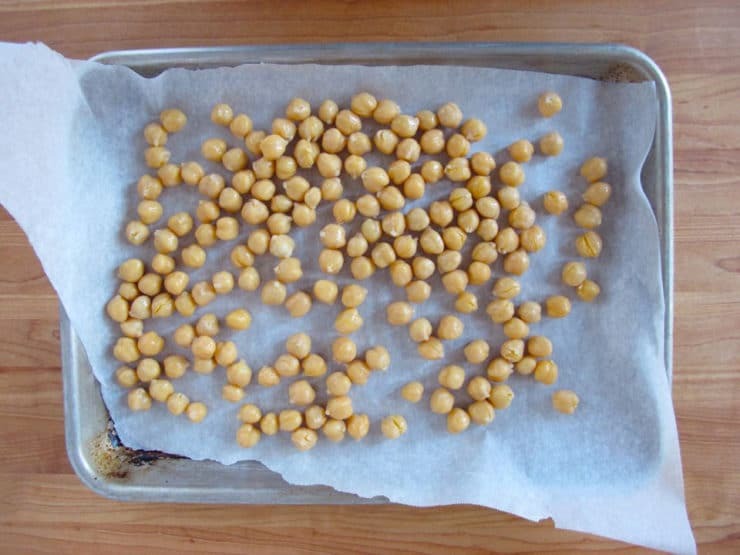 Drain your chickpeas after cooking and arrange in a single layer on a cookie sheet and place in your freezer. Once frozen, put in the container of your choice. I do this with berries as well. As far as I know, food-grade plastics do not release toxins unless heated (and usually that is above the boiling point of water). In particular, fats will help this process (so hot fatty stuff and plastic is an absolute no-no). Storing/freezing stuff in food-grade plastics (note plastic is a category of materials) shouldn’t be harmful. That said, there’s nothing preventing you from using glass to store everything you would in plastic. Oh, one consideration is that glass isn’t flexible – so don’t fill a glass jar with liquid and freeze it. As long as there’s air, that air can compress itself to accomodate, so then it would be safe. Did you ever figure out an alternative to storing in plastic? I am also trying to find good alternatives. You can freeze anything in glass canning jars. You just have to leave the some space at the top of the jar, like an inch to allow for expansion and wait to put the lid on until after its frozen. Hi Tori: Wonderful blog. Tried everything as instructed. Loved, loved, loved the result. Only thing I did not do was use baking soda. Carrying it a step further for making hummus, I have a suggestion. Bake a full bulb of garlic until it becomes a little caramelized on the top edges. Use one full bulb for about two cups cooked chic peas; add lemon, (real) virgin olive oil and parsley/cilantro to taste. If you cook the garlic this way it’s a lot easier for those with sensitive tummies. To bake bulb: cut top off garlic at the point where the individual cloves start to thicken (usually about top 1/8th). Place in tin foil. Pour olive oil over top to moisten (should pool a little at the bottom of bulb); I sprinkle with pepper now but you can leave this if you prefer not to have a pepper taste. Pull the tin foil together at the top of the bulb making sure the tin foil seals. Cook in moderate oven/toaster oven. Throw everything into blender – voila! Gotta go and get some now. Keep up the good work. if you use ” ”, please do correct for “au naturel”. Thanks for your recipes Tori! Tori’s use of quotation marks is actually correct. I believe this rule changed by the 1990s. Thank you Tori for all of the information. The comments were most helpful as well. I too had a problem with hard chickpeas after soaking and cooking for hours . I had purchased them at a reputable Health Food Store in my hometown of Antigonish so thought I must have done something wrong. I realize now they must have been old and had no life left in them. It was a huge stockpot full so a waste of time and effort. I too was advised that salt would STOP the softening process so always soak without. I had never heard of using turmeric or baking soda in the water so I have just tried BOTH in my cooking pot. I am looking forward to the results. I live on a farm and our well water is very hard. I can NOT cook beans to a soft stage with it. 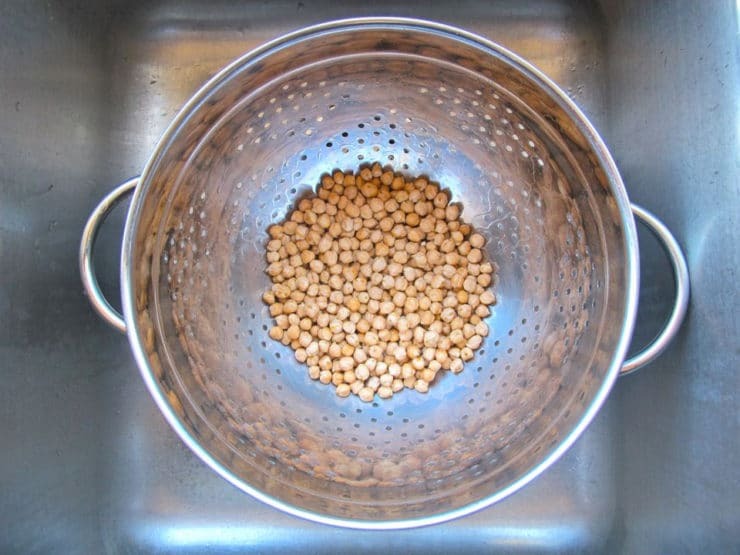 If you are still having problems with your beans not cooking to a soft stage try using filtered water. this was a marvelous tutorial! A friend bought me 2 bags of dried chickpeas because she knows how I adore hummus. I have been leery of soaking the entire bag because I didn’t want to make a gallon of hummus (slight exaggeration there). Now that I know how to effectively freeze the remainder I’m doing my happy dance and getting ready to make hummus tomorrow! Thank you! Your photos are disproportionately large for the width of the column. Resize immediately. Kelsi, I’m not sure what you’re talking about. Can you please tell me what browser you are using? Are you on mobile or desktop? If on mobile, what device/OS? On my end the photos look just fine. I think this is a joke. Nobody could be that rude and Imperious. Why do you boil them twice, first for 5 min. and then for 60-90 min.? OMG, SAVE the cooking juice!!!! It is the BEST egg substitute for baking and you can make all sorts of goodies with it. Using a electric pressure cooker will take about an hour and a half. I like to add a can of lite coconut milk, curry and cover the beans with an inch of water. Set the timer to 60 minutes and when it is done you have a mild curry. It takes about half an hour for the cooker to come pressure and the the timer starts. No need to soak at all. I stumbled upon this page because I made hummus but only after trying my hummus and realizing the taste was totally off did I learn that on top of soaking the beans overnight you have to *boil* them to actually cook them haha – I was eating raw garbanzos basically. Thanks so much for detailed post!! RIP my first batch of hummus. I regularly cook legumes. I use only dried or fresh, I never use canned. Do you have any idea why that is? I soak for 12 hours at least. I started to change water 5 times a day, soaking in moderate amount of water. I collect the foam. Hi Rozarka, this is strange! My guess is it has to do with the age and quality of the chickpeas. I can’t say for certain though. Always loved chickpeas but never got them dry. Thought I was getting the bulk equivalent of a can, then followed your instruct and they turned out to be more like four! Meaning, at Whole Foods the cans were across from the bulk and they were more than I needed and had some time off so measured a half pound but when I heated them, wow. Glad to know I can freeze them a year even tho prob won’t need to, but thanks! 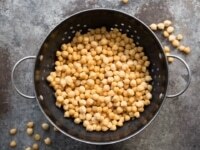 Excellent article on chickpeas – tells you everything you need to know to get them ready for any type of recipe. Thank you. Hi thank you for this page, i am introducing the family to this wonderful food. Easy & simple to follow! Thanks! !